A dinner date in the West Village was my initial introduction to this sparkling gem! A glass costs us about $8.00. We felt happy and bubbly by the end of the night. Marquis de la Tour Brut Rose is delicious. It’s perfectly priced for the budget glam gourmet. Hosting a dinner party on a budget? Impress your guests with this French sparkling wine. Enjoy a glass during a soothing bubble bath or pull out a pad and pen and write your 2012 goals over a glass of this wonderful delight. 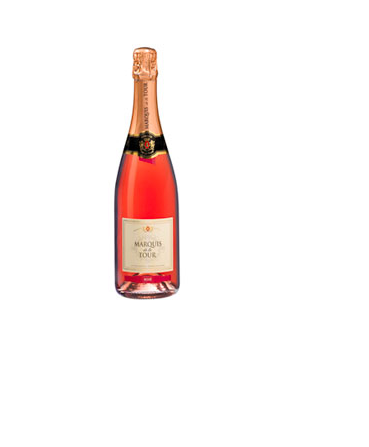 Whatever you choose to do while sipping Marquis de la Tour Brut Rose, savor every nip while simply celebrating life! Ripe notes of strawberries and freshly baked peaches make this a lovely choice. Drink responsibly!